DARK FLAME-- a New York Times & USA Today Bestseller! I just got the amazing news that DARK FLAME has landed THE IMMORTALS on the New York Times Bestsellers List for Children's Series at #5--and I can't thank you enough! The Children's Series List is insanely tough as it basically pits the total number of books in any given series against each other, and with only 4 books published in THE IMMORTALS so far, it's clearly your generosity, enthusiasm, and support that has landed me there! 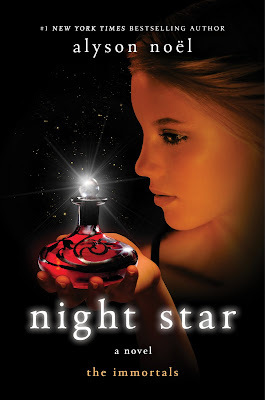 Oh, and I also just learned that it debuted on the USA Today Bestsellers list at #11--woo-hoo!!! 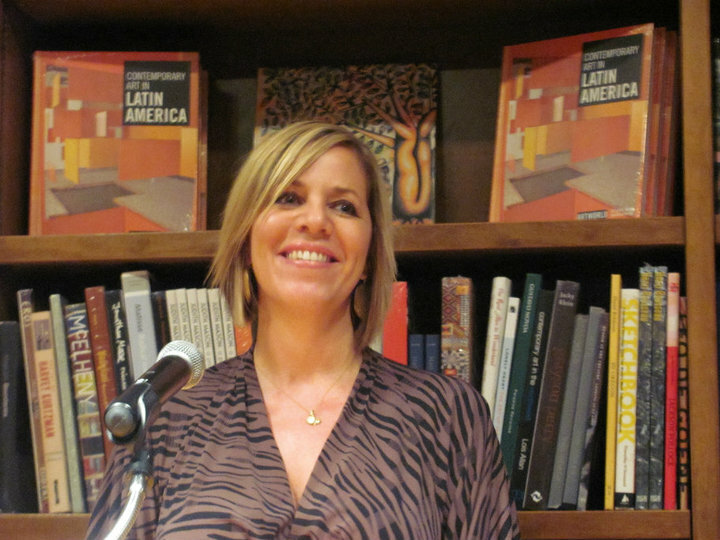 I always say I have the best readers in the world--but that's only because it's true! So, again, thanks to each and every one of you for making my release week so special--I couldn't have done it without you! 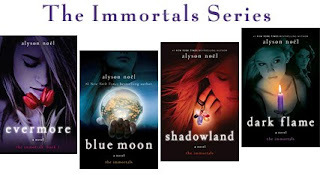 Book 5 in THE IMMORTALS series. 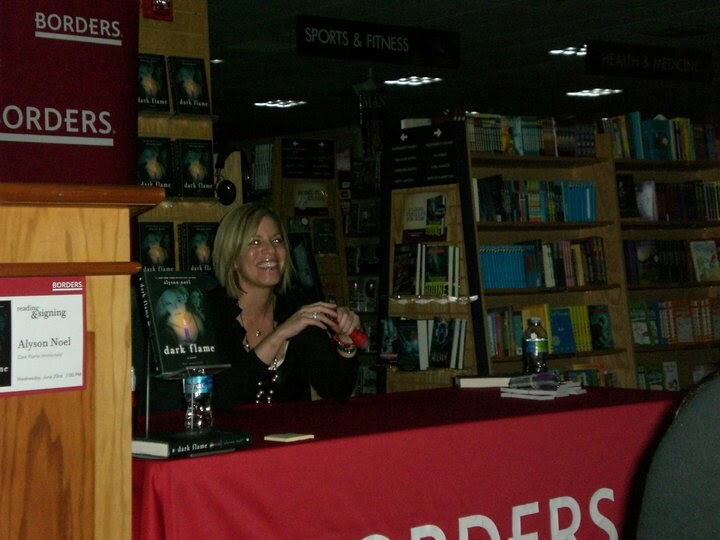 So last night I signed in my home town--The OC--and just like all of last week's signings, it was a blast! It was so good to see so many new faces, and so many familiar faces as well, and I can't thank you enough for taking the time to come out! As usual, the pictures tell it best, so, without further ado . . . The signing actually started with a pre-signing signing when a niece and a friend of one of my dearest childhood friends stopped by with their own copies of DARK FLAME! Me and "Ever"-she came dressed as Ever & her friend was going to come as Haven but couldn't make it--isn't she cute?! Me & Melina who just got into Berkley! (Yay!) And her hoodie came with earbuds attached--seriously the coolest thing ever--I could totally see Ever wearing that in EVERMORE! 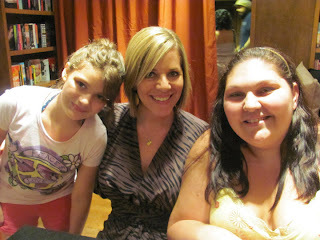 Oh, and for a really cute recap on the Miami signing, click HERE! 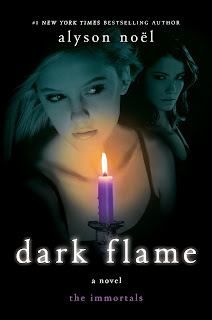 And for the story behind the DARK FLAME cover, click HERE! 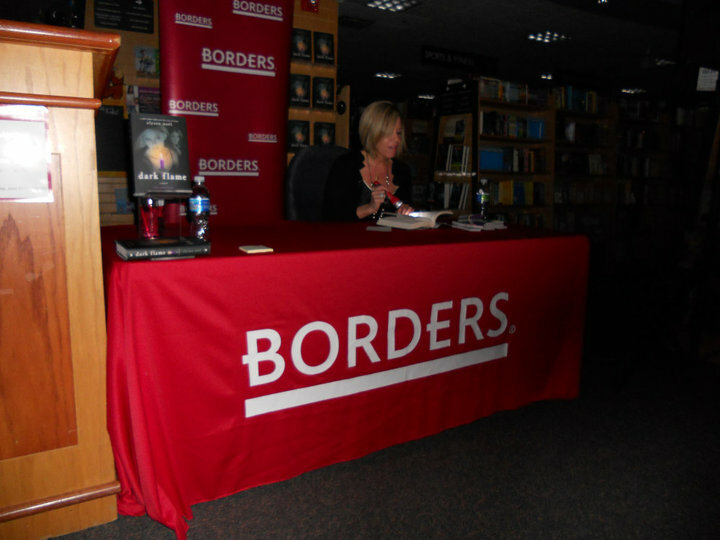 I'll be signing books tonight at Borders in Mission Viejo, CA--it's my only California stop on this tour, so I really hope you can make it! So, I'm back home in not-so sunny CA (it's pretty overcast in Laguna ), but I wanted to give a big shout out to thank everyone who made it out to the Miami sgning! 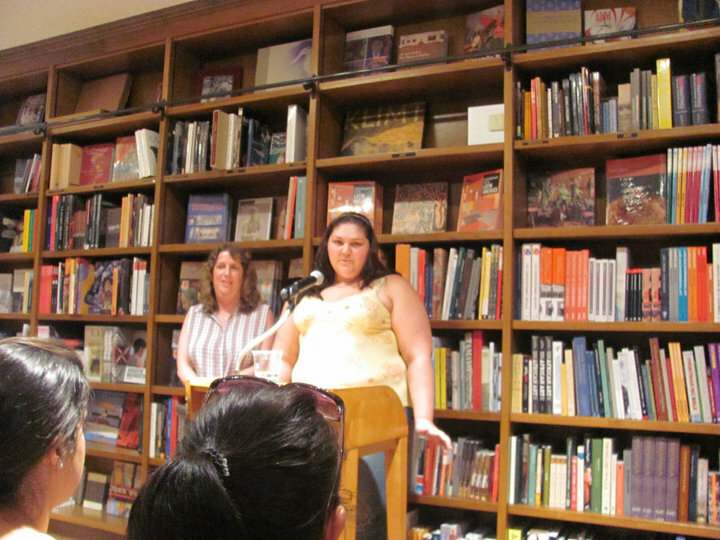 Books & Books is an awesome store and I was so thrilled by how many of you showed up--some from quite a distance--so thank you for that! I had a blast and I hope you did too! 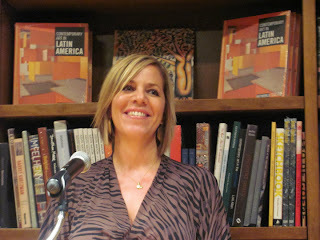 Oh, and thanks to my Brazilian readers who sent messages via Livia--you guys are amazing!! The all teen, all girl, opening act--they ROCKED! The two that traveled the farthest introduced me--though there was a young girl who came from Ohio as well! And I really hope to see you there! So what can I say about Dallas, except that despite the lack of tornados, despite the availability of electricity, (see the somewhat supernatural Chicago signing below! ), Dallas proved itself to be an absolute blast! I got to sign a shoe! Oh no, this was a brand spanking new orange Chuck Taylor! I had such a great time meeting all of you and want to give a big thanks for taking the time to come out! Oh, and a special shout out to the girl who came all the way from Rhode Island as well as the one who drove all the way from Oklahoma, and the one who gave me the necklace she made!! I swear, I feel like the luckiest author in the world to have such wonderful, generous readers like you! These pics pretty much say it all--courtesy of those who were there!! Reading Chapter 9 by flashlight! PS- I hear there will be TV coverage! Wow. I just got back from what will surely be my most memorable signing ever!! Partly, because I still can't believe how many awesome readers braved the tornado to get there--(thanks to each and everyone of you--with a special shout out to those of you who came in all the way from Michigan & Indiana!!) 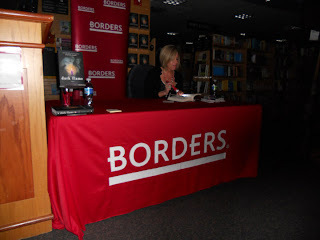 but also because the second I started, the electricity went out, and so we proceeded to talk & sign in the dark (which, was actually pretty appropriate considering the title is DARK FLAME and all)--and it ended up being so much fun, I'm afraid it set an impossibly high standard for all future signings! Oh man, I cannot thank you all enough for the outpouring of enthusiasm and support! 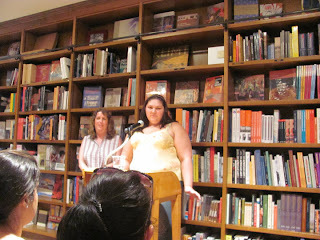 I always say I have The Best Readers Ever--but that's only because it's true! 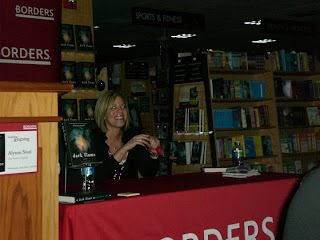 The signing at the Mall of America was fabulous--I met Facebook friends, two sisters who drove 10 hours, a girl who flew all the way from Colorado, and many, many more--thanks for making my release day so special! And speaking of release day, I started the day with a really fun radio interview with MN station KWNG, then later, I stopped by the KARE TV studios to do an interview with news anchor Pat (loved him-he's awesome! ), which you can see HERE! Oh, and last but not least, in non-IMMORTALS related news, I'm thrilled to announce that the film rights to my adult novel, FLY ME TO THE MOON, have been optioned by Fox 2000 with Ridley Scott's Scott Free Productions set to develop!! That's it for now . . . 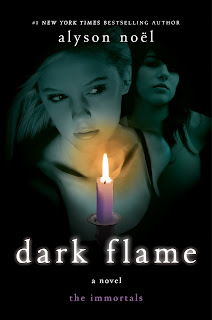 It's finally here--the DARK FLAME release day!! Tonight I'll be signing hot-off-the press copies at 7:00 PM at the Mall of America, MN in the Mall Rotunda and would love to see you there--or at any of the other stops on The DARK FLAME TOUR!! All the tour details can be found on the side bar to the right, or by clicking HERE! Thanks so much for all of your enthusiasm & support--I couldn't do it without you! Also, there is great news for SHADOWLAND--it's been nominated for "Best Read" in the Chapters Indigo Books Inaugural Teen Reads Award!" Between now & July 25, you can cast your vote once a day, everyday, and while you're doing so, you increase your chances to win some awesome prizes! All you need to do to get started is click HERE! I also gave a fun interview for the Orange County Register, (where I talk about what a slacker I was in high school! ), which you can read online HERE! Roman leans in the doorway and laughs, beckoning me near. And despite everything I know about good and evil, right and wrong, immortals and rogues, I step forward. My gaze fixed on Roman--gorgeous, glorious Roman. He's all I can see. All that I need. "Always knew you'd come around." He grins, gaze slowly taking me in as he buries his fingers in my tangle of hair. "Welcome to the dark side, Ever. I think you'll be quite happy here." Instant Manifestation doesn't work in these parts. "So now you've seen him. The monster I used to be." If you want to read more, the full review is HERE, and she was very careful not to give away any spoilers which I really appreciate! Smiling as I pull him back to me, back to that blazing red field of that long-ago day. "Summerland contains the possibility of all things." 5 more days . . . Welcome to the dark side, Ever, I think you'll be quite happy here. 6 more days . . In just one week from today, DARK FLAME will be in stores & I will be on tour!! Details HERE! He smiles, Ouroboros tattoo flashing in and out of view, its beady eyes seeking mine as its tongue slithers about. The door swings open and he stands there before me, all sparkly blue eyes, glistening white teeth, and suntanned skin. 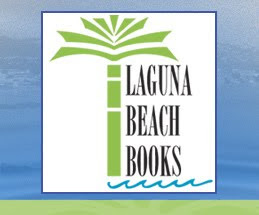 For those of you who'd like a signed copy of one of my books but are unable to make it to a book signing, I'm pleased to announce that I've partnered with Laguna Beach Books, my local indie, to provide personalized, autographed copies! All you have to do is contact them at: 949.494.4779, place your order for whatever book you'd like, tell them who you'd like me to sign if for, then I'll head down to store, sign, and they will send it to you! "Four hundred years of losing out on the girl of my dreams isn't sitting very well with me these days." We've been working on it for months, well, actually, Maddee over at Xuni.com has been working on it for months--I've just been oohing & awing at all of the design samples she sent! But, alas, the new & improved, alysonnoel.com site is now live!! Featuring updated playlists, new FAQs, and for those of you who asked, writing/publishing advice is also included in those FAQs! You can see it all HERE! With DARK FLAME releasing just 3 weeks from today--I thought I'd start feeding you some mini-teasers. "It's wrong to use magick for selfish, nefarious reasons. There's karma to pay & it'll come back times three."